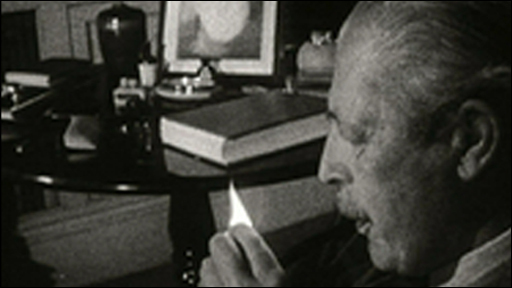 In the 1950s the Chancellor of the Exchequer Harold Macmillan put the financial benefits of cigarettes over the nation's health, records show. Then health minister Robert Turton advised the 1956 Cabinet to "constantly inform the public of the facts" of the link between smoking and lung cancer. But Mr Macmillan, who was prime minister from 1957 to 1963, said tax revenue from smoking was too valuable. The shorthand notes were released from the National Archives in Kew, London. Mr Turton told ministers there was not yet "scientific 'proof"' of the hazards, but admitted the "statistical picture is clear". Then prime minister Anthony Eden responded by saying the "time is arrived when we should decide whether we have a line". 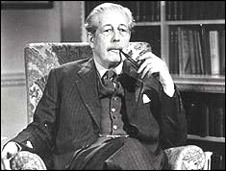 But Mr Macmillan, who became prime minister after Mr Eden resigned following the Suez crisis, said: "Expectation of life 73 for smoker and 74 for non-smoker." "Treasury think revenue interest outweighs this. Negligible compared with risk of crossing a street," he added. In response to a question from another minister asking if it is "necessary to expose facts", Mr Macmillan replied: "But in relation to other facts?" In the end the government resolved to wait until later in the year when another medical report was due. One ex-smoker who says he should have been warned is Peter Powell from Towcester, Northamptonshire. Mr Powell was a non-smoker until he joined the Army and opened his duffle bag to find his cigarette ration. For the next 50 years he smoked as many as 100-a-day, until finally giving up last year. He says that although his health is now improving, the smoking left him so weak that he did not have the lung power to blow up a balloon. "They really gave us the impression they didn't know anything else about it. "They should have stopped the damn thing. I think I'd have been a lot healthier. "I didn't know anything better, but had I known I might not have started." Now in his 70s, Mr Powell tried to give up in his 30s and 40s, but always fell back to smoking. "I tried like a devil, I used to eat wine gums instead of the cigarettes, but it was a hell of a job." What would he say to Mr Macmillan, knowing now that he could have been warned of the dangers? "I wouldn't be polite, I don't think, I daren't say. "It's wicked, that is. They shouldn't have given us our fags in the first place, just given our money and let us get on with our training. "I'm sure there are a lot of men who are ruing that day. "If I had realised then that I was going to be doing a lot of damage to myself, I wouldn't have touched them," he said.